SLIP SAVERS is a "sister company" to Anthony Home Improvements, Inc., a 59-year-old, third generation multi-division family business. We began as plumbers and were once known as Anthony, The Family Plumber. This gained us decades of experience in the remodeling industry. Today, led by Stephen Klein, we are proud to be an exclusive dealer for BATHWRAPS systems and Jacuzzi Walk-In Bathtubs and other mobility products. Through dealing with senior and others with mobility issues, Mr. Klein learned about the dangers of slips and falls, not only in the home, but in commercial businesses. It was this overwhelming problem that led him to become this area's exclusive dealer for what experts agree is a revolutionary treatment system that can literally make a floor (or tub) surface less slippery as it becomes wetter. When explaining what we do and the results, most people find this too good to be true. Seeing is believing and that's why we'll analyze your most slippery floor/bath surfaces, pick the right product and application, do a before and after demonstration and then give you a price. When you move forward, you'll have peace of mind and if we are able to eliminate just one slip and fall accident, you'll experience an incredible payback on your minimum investment. 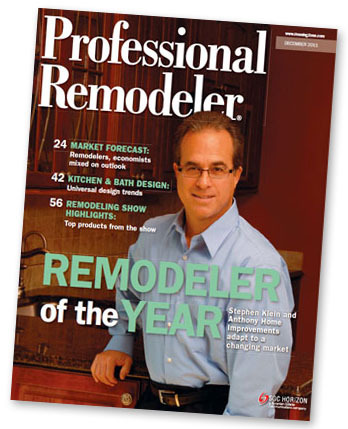 Our company was honored as the 2011 Professional Remodeler Magazine's Remodeler of the Year. We are a multi-division company and for nearly 20 years, we were the exclusive bathroom and kitchen installers for SEARS in the Delaware Valley. Another division of our company was the exclusive bathroom and kitchen installers for 59 of The Home Depot stores in the tri-state area for 10 years. You cannot represent these major retailers without always taking care of the customer. Don't we sound like the type of company you would feel comfortable dealing with? If so, let Slip Savers SAVE you money, aggravation, unnecessary and costly lawsuits, increased insurance and workers' comp premiums from slip and fall accidents, loss of your valuable labor, and possibly even loss of a life.